A group of 13 low-risk inmates serving life sentences at a minimum security facility in Rockwell City will raise, socialize, and care for puppies, so that the dogs can later be trained as service animals via the Des Moines-area non-profit Paws & Effect, Iowa Department of Corrections officials recently announced. The North Central Correctional Facility houses approximately 500 offenders. Located in Rockwell City, Iowa, the institution emphasizes individual accountability and responsibility, and offers a variety of education and life skills programs. Programming also includes vocational education opportunities through Iowa Central Community College, and working in the facility's gardens, which produce more than 30,000 pounds of vegetables annually. "The North Central Correctional Facility is honored to be given the opportunity to work with Paws & Effect," says Warden Robert Johnson. "Initial interest was formed by offenders convicted of a life sentence who believe this program will provide a means to give back to the communities by providing service animals specifically aimed at assisting veterans and children. These men host a myriad of skill sets as well as possess a deep history in training service animals. We at the North Central Correctional Facility believe this program also fulfills our mission of 'Creating Opportunities for Safer Communities,' as we will be assisting those experiencing specific hurdles in their lives the opportunity to not only feel safe but also thrive in their environment with a beautiful, well-trained therapy/service animal at their side." Paws & Effect Executive Director Nicole Shumate says she looks forward to the partnership, particularly as an extension of her organization's foundation in promoting compassion and care through the human-animal bond. "It is a privilege to work with offenders, whose efforts include contributing to the community in a healthy, effective, and positive way," Shumate says. "Too often, we shun criminals whose crimes will keep them incarcerated for the rest of their lives, foregoing opportunities of rehabilitation. In a state that has eliminated the death penalty, we have an obligation to offenders that extends beyond the minimal physical needs of keeping them alive in a contained and restricted environment." "The value that offenders will be bringing to Paws & Effect and service dog recipients can not be overstated. With a collective span of decades of service dog training between them, they bring a talent that is difficult to find in any other place. We are honored to stay true to our mission of taking a moment and making a difference." Service animals are trained to perform physical tasks to assist a specific individual. Given their socialization and obedience training, animals who do not meet service animal requirements may still be employed and placed as therapy animals, performing jobs and boosting morale in libraries, hospitals, and other facilities. Established in 2006 and based in Des Moines, Paws & Effect is a 501(c)(3) non-profit organization that raises, trains, and places service dogs with military veterans and children diagnosed with medical needs. The group also registers therapy animals through Pet Partners. Its Beaverdale neighborhood storefront also serves as a training center, as well as home base to Troop 232 of the Dog Scouts of America. Dine Out During Our 4th 'Tables & Tails' Fund-Raiser! The Americans with Disabilities Act of 1990 is one of the laws that helps ensure people who use service animals can access buildings and businesses in the course of their daily lives. Together with leading Iowa restauranteurs and other Iowa Jaycees, you can help Paws & Effect will celebrate the 27th anniversary of this landmark legislation with its Fourth Annual "Tables & Tales" event! Throughout July, select Central Iowa restaurants will contribute a 10 percent or more of their proceeds to support training service and mobility animals for military veterans, children, and others. "These business owners regularly open their doors to make dining experiences that are memorable, safe, and enjoyable for all patrons," says Nicole Shumate, executive director of Paws & Effect. "We're humbled that they're extending their hospitality to help us celebrate and improve service-dog access in our community." The next Paws & Effect Book Club selection is the 2007 best-selling memoir "Chosen by a Horse" by Susan Richards. The book tells the story of how Richards rescued a retired race horse named Lay Me Down. 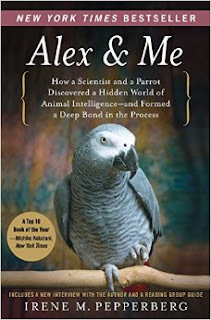 According to book jacket copy, "This gentle creature―malnourished, plagued by pneumonia and an eye infection―had endured a rough road, but somehow her heart was still open and generous. It seemed fated that she would come into Susan’s paddock and teach her how to embrace the joys of life despite the dangers of living." Says Paws & Effect Executive Director Nicole Shumate: "Too often, we underestimate the power of the human-animal bond, brushing aside relationships that are available to us. We shy away from difficulty, from pain, from commitment and challenge. But there, in the times that seem most unbearable, we find the very things we seek: connection and love. In 'Chosen by a Horse,' we are offered the opportunity to follow the journey one woman makes when she accepts the inevitable hardships that come with sharing the pain of another, and to witness the outcomes that are possible." In Central Iowa, the book club session will be moderated by Ashley Anderson, KPA-CTP, Paws & Effect's lead dog trainer. With more than a decade of experience as an equestrienne, Ashley brings forward an understanding of the ways in which horses and dogs benefit from their relationships with their caretakers—and us from them. More often than not, Ashley is chosen by a myriad of animals, each being escorted to their next loving home. If sold out on the shelves, the book may be ordered via the store, or via the Barnes & Noble website here. In Western North Carolina, the book club session will be moderated by Susan Knapp, the founder and executive director of Heart of Horse Sense. Located on 110 acres in Marshall, North Carolina, Heart of Horse Sense is the charitable component of Horse Sense of the Carolinas, an internationally recognized leader in the field of Equine-Assisted Psychotherapy and Learning (EAPL). Susan brings a longstanding commitment for experiential learning which fosters life skills and character development. Heart of Horse Sense extends EAPL opportunities to children and veterans at no cost. Central Iowa-based non-profit Paws & Effect has been selected by the family of Devyn Pereira, 9, of suburban Rochester, N.Y., to assist in the selection, training, and validation of a replacement service dog. Devyn was born with Angelman Syndrome, a genetic disorder that results in developmental delays, seizures, and autism. Devyn's current service dog allows her to walk unassisted by others; protects her from "eloping" or wandering away from the classroom; and alerts her teachers to pending seizures. Since September 2015, the U.S. Department of Justice's Civil Rights Division has engaged in litigation against the Gates-Chili Central School District, Monroe County, N.Y. for denying Devyn's right to a service dog at school without hiring a handler other than Devyn herself. In August 2017, the schools' motion for summary judgement was dismissed, and the case continues in U.S. District Court. According to court documents, the family has paid more than $25,000 for a dedicated adult dog handler since 2011. The adult handler spends about 15 minutes out of each school day working. Previously, teachers and school staff would tether or untether Devyn from her service dog, as needed. Devyn is attended by a dedicated, one-on-one teacher's aide, who is a school employee. The dog is trained to not require food, water, or bathroom breaks during the school day. Nicole Shumate, executive director for Paws & Effect, said the organization will help identify a service dog to help replace Devyn's current one, a 110-pound Bouvier des Flandres named Hannah. The hypoallergenic breed was selected because of Devyn's asthma and allergies. The puppy will be identified and trained via the organization's ongoing training program relationship with Missouri Puppies for Parole. "We are excited to become part of Devyn's team! Following Devyn's journey over several years, watching her blossom into a wonderful young lady, has been inspiring," says Shumate. "Paws & Effect intends to support the Pereira Family as they continue to navigate through the myriad of challenges in front of them, joining an effort that we feel very strongly about." A 2009 graduate of the Drake University, Des Moines, Iowa, Shumate herself was involved as plaintiff in a case regarding service dog access that reached the Iowa Supreme Court in 2014. 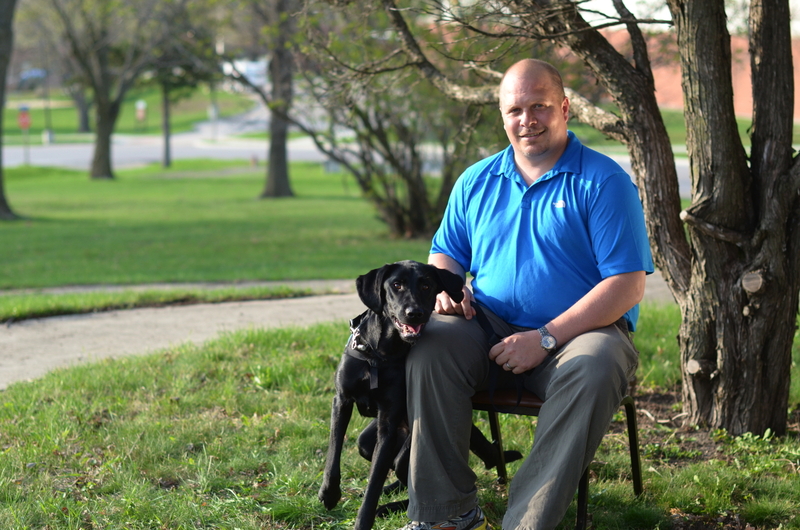 The case of Shumate v. Drake University regarded the rights of a handler-trainer of a service-dog-in-training to access public buildings under state law. In an announcement made earlier this month via social media, Devyn's mother Heather said, "When we first researched a service dog for Devyn, we only had a basic idea about the process or even the laws that applied. Now years later, we really appreciate how important it is to work with an agency that is forward thinking when it comes to service dog access and regulation of the industry. In many ways, Devyn has become the face of service dogs in schools, which has given us the opportunity to talk to a lot of different agencies. We have to be picky—Devyn’s first service dog exceeded our expectations and there is some pressure; the next pup has big shoes to fill." Fund-raising toward Devyn's next service dog began with a Feb. 9 event in Rochester, N.Y. The family hopes to raise up to $15,000 toward the cost of acquiring, training, and equipping a replacement for the retiring Hannah. A "Dog for Devyn" Facebook page is here. Beginning with her experience as a medical actor who was paid to act out symptoms for medical students to diagnose, Leslie Jamison's visceral and revealing essays ask essential questions about our basic understanding of others: How should we care about each other? How can we feel another's pain, especially when pain can be assumed, distorted, or performed? "At its heart, everything that Paws & Effect does—through its volunteers, its service animals, Pet Partners, and other programs—relates to improving how we relate to each other," says Executive Director Nicole Shumate. "This book is a natural fit for engaging in that conversation." The book club discussion will take place starting 6:30 p.m., Sun., May 21, at Barnes & Noble, Shoppes At Three Fountains 4550 University Ave, West Des Moines, Iowa. The book is available at Barnes & Noble, and via the company website here. Join Us for 'One Heart, Four Paws' 2017! The 2017 "One Heart,Four Paws" event will take place from 1 to 3 p.m., Sun., February 12 at the Blank Park Zoo, 7401 S.W. 9th Street, Des Moines, Iowa. The event will include a silent auction, a book corner, a tricks performance, and more. "We work hard with our handlers, partners, volunteers, and animals to improve lives in our community, but every so often, it's good to have a party," says Paws & Effect Executive Director Nichole Shumate. "'One Heart, Four Paws' is our celebration of the human-animal bond, which, appropriately enough, takes place annually around Valentine's Day!" Established in 2006 and based in Des Moines, Paws & Effect is a 501(c)(3) non-profit organization that raises, trains, and places service dogs with military veterans and children diagnosed with medical needs. The group also registers therapy animals through Pet Partners. Its Beaverdale neighborhood storefront also serves as , as well as home base to Troop 232 of the Dog Scouts of America. Persons wishing to attend "One Heart, Four Paws" event can R.S.V.P. via e-mail nicoleshumate AT paws-effect DOT org. There is no charge for the event. The next Paws & Effect Book Club selection is the non-fiction work "Tribe: On Homecoming and Belonging" by Sebastian Junger. Junger is the author of such books as "War" (2010) and "The Perfect Storm" (1997), as well as co-director of the documentaries "Restrepo" (2010), "Korengal" (2014), and "The Last Patrol" (2014). "We have a strong instinct to belong to small groups defined by clear purpose and understanding—'tribes,'" marketing materials for the book read. "This tribal connection has been largely lost in modern society, but regaining it may be the key to our psychological survival." The book club discussion will take place starting 6:30 p.m., Sun., Nov. 6, at Barnes & Noble, Shoppes At Three Fountains 4550 University Ave, West Des Moines, Iowa. We are Charity Partner to 8 'Hero Dog' Nominees! Paws & Effect is the proud charity partner of eight therapy dogs nominated as finalists in the 2016 Hero Dog Awards, conducted annually by the American Humane Association. Therapy dogs are socialized and trained to provide assistance to more than just one person. As a charity partner, the Des Moines, Iowa-based non-profit will be awarded up to $2,500 if any of these dogs achieves the highest number of on-line votes in their category. Voting ends 12 noon Pacific Time April 27, 2016. You can see the entire ballot and vote here. You can vote in each category once per day. In last year's contest, more than 1.5 million on-line votes were cast by the public. 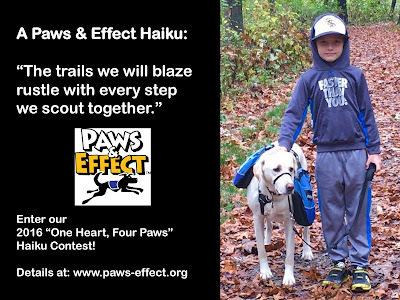 Paws & Effect also has a connection to Hunter, a 2016 Hero Dog nominee in the service dog category. Service dogs are trained to perform tasks for specific individuals, in order to mitigate diagnosed physical and/or mental conditions. Established in 2006, Paws & Effect is a 501(c)(3) non-profit that raises, trains, and places service dogs with military veterans and children diagnosed with medical needs. Paws & Effect also hosts Pet Partner training courses and evaluations, supporting therapy teams throughout the state of Iowa. Paws & Effect is widely known for its dog agility programs, where children may complete their physical, occupational, and speech therapy while taking a therapy dog through an agility course. Tulip, a rescued American Pit Bull Terrier from Raleigh, N.C., whose favorite place is a special-needs school, where many children have autism, Down syndrome, or have had traumatic experiences. Tulip visits for their reading program and to help give them comfort and support. Ellie Belly Sugar Jelly, a certified therapy animal from Belleville, Mich., who visits hospitals, senior centers and libraries. Jeanie, a three-legged rescue from Lake Charles, La., who visits hospitals, nursing homes, reading programs, and veteran’s homes, where "she is a hit with fellow amputees." She also comforts children at an advocacy center, as they are questioned by investigators in abuse cases. Skooter, a Labrador/shepherd mix from Livermore, Calif., who got his accidental start as a therapy dog when providing assistance to an ailing marathon runner. He now has more than 100 volunteer hours working with veterans, senior citizens, and children. Karma, a rescued Great Pyrenees who was originally trained in prison to guard an equine therapy herd. Instead, the dog from Webster Groves, Mo. demonstrated an ability to connect with troubled adolescents. Jake, a 12-year-old dog from Yukon, Okla. who works to provide comfort to those who are physically or emotionally distressed, including people in hospital or mass trauma sites. "As a senior dog, Jake’s calm and patient demeanor with patients is so amazing to watch," his nomination reads. Sky, a fluffy Husky rescue from Hollywood, Md., who works with veterans and hospice patients, who has brought voice and howls of laughter to those he has visited. Reminder: Voting ends 12 noon Pacific Time April 27, 2016. You can see the entire ballot and vote here. You can vote in each category once per day. 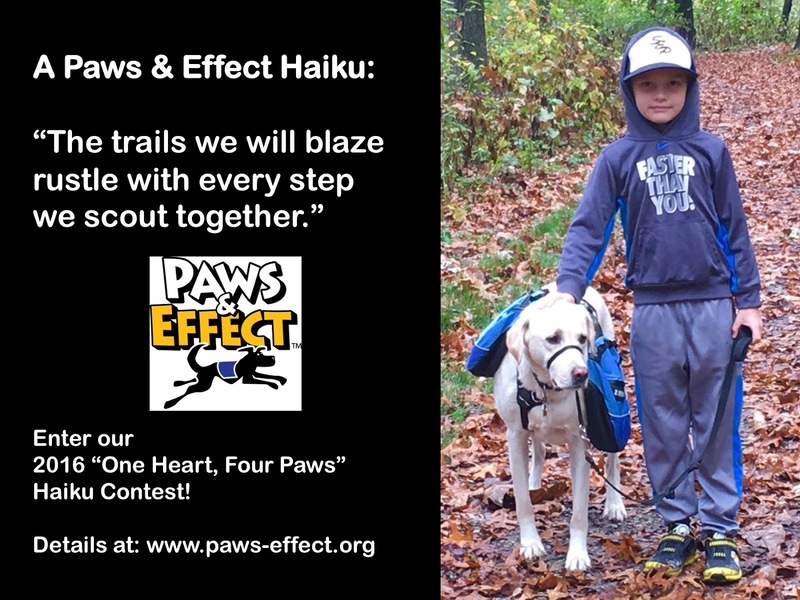 At its February 2016 "One Heart, Four Paws" event, Central Iowa non-profit Paws & Effect announced the winners of the haiku contest celebrating the connections among animals and humans. The event was held at the Blank Park Zoo, 7401 S.W. 9th Street, Des Moines, Iowa., and featured the book launch for Missouri author Heddie Wittlin-Leger's "Hero to the Rescue." . For more information about the "Hero to the Rescue" book launch, click here. Established in 2006 and based in Des Moines, Paws & Effect is a 501(c)(3) non-profit organization that raises, trains, and places service dogs with military veterans and children diagnosed with medical needs. The group also registers therapy animals through Pet Partners, and regularly hosts NADAC-sanctioned dog-agility events for fun and fund-raising. Its Beaverdale neighborhood storefront also serves as a training center, as well as home base to Troop 232 of the Dog Scouts of America. "We were very pleased with how much emotion and even humor people were able to communicate in just a few, carefully selected words," says Paws & Effect Executive Director Nicole Shumate. "The poems selected for recognition convey just how interconnected we all are." Poems were selected by journalist-turned-poet Randy Brown, author of "Welcome to FOB Haiku: War Poems from Inside the Wire." 1. Dog either sits and won’t move, or pulls like she's in the Iditarod. 2. As we walk through the brown trees, the dog's leash scrapes off and scatters their seeds. 3. Be mindful of pets, for they will forever be mindful of you, too. 4. Your pet's job is to bear witness; to love you just for being alive. 5. If you want to have the best seat in the house, you'll have to move the cat. 1. Chirping birds outside. Little lion through the glass. Together, watching. 2. Big green eyes looking. Fluffy black fur, gentle paw. Curious, my friend. 3. Footprints in the snow, a companion in the cold. In moonlight, we go. These dogs fill my heart: Casha, Draco, and Ollie weather storms with me. Central Iowa non-profit Paws & Effect, in conjunction with publishers Middle West Press LLC, is conducting a Second Annual writing and art contest celebrating bonds among humans and animals. Winners and finalists will be selected in youth (up to age 16) and adult categories. Deadline is Sat., Jan. 9, 2016. There is no entry fee. Finalists will be recognized with a special print publication of their work, which will be presented at Paws & Effect's annual "One Heart, Four Paws" Valentine's Day reception. "We chose the haiku because of the form's familiarity and accessibility, whether you're a grade-schooler or graduate student," says Middle West Press editor Randy Brown. "We also want people to focus on moments, interactions with animals in the home, in nature, and at work." Established in 2006 and based in Des Moines, Paws & Effect is a 501(c)(3) non-profit organization that raises, trains, and places service dogs with military veterans and children diagnosed with medical needs. The group also registers therapy animals through Pet Partners, and regularly hosts NADAC-sanctioned dog-agility events for fun and fund-raising. Its new Beaverdale neighborhood storefront also serves as a training center, as well as home base to Troop 232 of the Dog Scouts of America. says Paws & Effect Executive Director Nicole Shumate." All hardcopy entries become the property of Paws & Effect and will not be returned. Entrants aged 15 and younger may choose to submit short poetry that varies from the haiku form, and/or visual artwork. Consist of three lines; each respectively comprising 5, 7, and 5 syllables each, for a total of 17. Ideally incorporate a reference to one of the four seasons, or to nature. Entries will be judged on factors such as: originality, creativity, humor, and adherence to the specified haiku format. 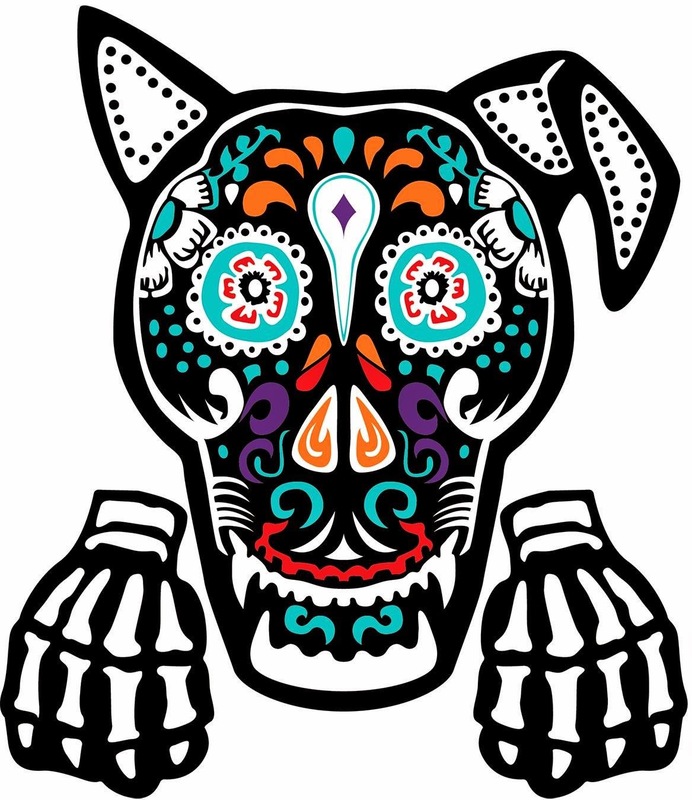 A pet-friendly celebration of El Dia de Los Muertos ("The Day of the Dead") will be hosted by Central Iowa non-profit Paws & Effect at Living History Farms, 11121 Hickman Road, Urbandale, Iowa, from 12 noon to 3 p.m., Sat., Oct. 24. El Dia de Las Meurtos is a traditional holiday that originates in Mexico, during which family and friends gather to remember and celebrate their ancestors and other loved ones. It is usually observed close to Halloween. A procession and blessing of the animals will take place at 1:30 p.m. A photographer will be on hand to take "family" photos for a free-will donation. Costumes are encouraged! Live music will be provided. Food, beer, T-shirts, and other wares will be available for sale during the event. Cost for the event is $15, which includes one beer ticket and one pint glass. Established in 2006, Paws & Effect is a Des Moines, Iowa-based 501(c)(3) non-profit organization that raises, trains, and places service dogs with military veterans and children diagnosed with medical needs. The group also registers therapy animals through Pet Partners, and regularly hosts NADAC-sanctioned dog-agility events for fun and fund-raising. Its new Beaverdale neighborhood storefrontalso serves as a training center, as well as home base to Troop 232 of the Dog Scouts of America. A pet-friendly celebration of El Dia de Los Muertos ("The Day of the Dead") will be hosted by Central Iowa non-profit Paws & Effect at Living History Farms, 11121 Hickman Road, Urbandale, Iowa, from 12 noon to 3 p.m., Sat., Oct. 24. El Dia de Las Meurtos is a traditional holiday that originates in Mexico, during which family and friends gather to remember and celebrate their ancestors and other loved ones. It is usually observed close to Halloween. Established in 2006, Paws & Effect is a Des Moines, Iowa-based 501(c)(3) non-profit organization that raises, trains, and places service dogs with military veterans and children diagnosed with medical needs. The group also registers therapy animals through Pet Partners, and regularly hosts NADAC-sanctioned dog-agility events for fun and fund-raising. Its new Beaverdale neighborhood storefront also serves as a training center, as well as home base to Troop 232 of the Dog Scouts of America. On Wed., Aug. 19, 2015 Paws & Effect was notified by canine I.D. chip-tracking vendor HomeAgain that its 6-year-old service dog, a black Labrador named "Honor," was recovered by law enforcement authorities in North Carolina. The dog is safe and healthy. Established in 2006, Paws & Effect is a Des Moines, Iowa-based 501(c)(3) non-profit organization that raises, trains, and places service dogs with military veterans and children diagnosed with medical needs. According to law enforcement and media reports, Wade Allen Baker, 44, formerly of Marshalltown, Iowa, was involved in a Waynesville, N.C. church shooting incident that occurred on Wed., Aug. 19, 2015. Baker reportedly died during this incident. Paws & Effect placed service dog "Honor" with Baker in March 2012, after he was referred by a treating physician at Veterans Affairs Medical Center, Iowa City, Iowa. He attended an intensive 2-week dog handler training course in March 2012, and, like all Paws & Effect handlers, had regular follow-up communication with Paws & Effect regarding dog training and handling. While still located in Iowa, he occasionally assisted with Paws & Effect's efforts to educate the public regarding service dog use and access. Paws & Effect Executive Director Nicole Shumate, along with the non-profit's board of directors, worked with North Carolina agencies to ensure safe return of Honor to the Baker family. "The loss of life of this veteran is tragic and devastating for his family. We are thankful that there was reportedly no further injury or loss of life to law enforcement and the public. Service dog Honor has been returned to the family to continue in his roles of stress reducer, supporter, and loved family member." Come Dine with Us at Second Annual 'Tables & Tails'! The Americans with Disabilities Act of 1990 is one of the laws that helps ensure people who use service dogs can access buildings and businesses in the course of their daily lives. Together with Iowa restaurateurs, Central Iowa non-profit Paws & Effect will celebrate the 25th anniversary of this landmark legislation with its Second Annual "Tables & Tales" event! Throughout July, select Central and Eastern Iowa restaurants will contribute a portion of proceeds to support training service and mobility dogs for children and military veterans. "These business owners regularly open their doors to make dining experiences that are memorable, safe, and enjoyable for all patrons," says Nicole Shumate, executive director of Paws & Effect. "We’re humbled that they’re extending their hospitality to help us celebrate and improve service-dog access in our community." "Restaurant and bar owners, hospitality managers, and food service personnel are often at the front lines of ensuring that guests who use service dogs are able to exercise their rights of public access hassle-free," says Shumate. "Service dogs aren’t pets or companions. Instead, a service dog is trained to perform physical tasks to mitigate a given person’s one or more medical conditions. The reasons for someone using a service dog may not be visible, but they are vital to that person’s quality of life." "It’s just like using a cane, or wearing glasses,” she says. “And the law protects all of us." Eden's "Sundae Sunday," featuring ice cream from Indianola's Outside Scoop: July 26, 11 a.m. to 3 p.m.
Members of various Paws & Effect programs recently established Dog Scouts Troop No. 232. The troop is an affiliate of Dog Scouts of America, a non-profit that started in 1989. Through a certification and specialty "merit badge" program incorporating more than 80 awards, the organization promotes safe, fun, and ethical activities for dogs and their handlers. There are more than 38 posts nationwide, in more than 22 states. Merit badges categories include those in scouting, community service, agility, trail work, and other activities. Dog Scouts and their handlers must be capable of acting as good citizens, including sit, down, stay, come, heel and leave it. Handlers must successfully pass a 33-question written examination. The written test covers topics such as: reward-based training, learning theory, and the mission of Dog Scouts of America. As of June 10, a pawful of Troop 232 dogs have already achieved the Dog Scout certification and title. Prior to certification, dogs are optionally called "Cadet Scouts." "Sponsoring Dog Scout activities are a great way to regularly gather people and dogs together, especially those who may live too far away for weekly classes," says Paws & Effect Executive Director Nicole Shumate. "Service dog recipients and Pet Partners will now have options that are more accommodating to their circumstances. Plus, what military veteran doesn't immediately want their dog to 'tab-out,' with plenty of qualification badges?" At a weekend troop meeting conducted at Brown's Woods in West Des Moines, Iowa, participants worked toward their Hiking badges. The next weekend-long troop meeting will be Sept. 25-27, 2015. Training and preparation will take place on Friday and Saturday, with evaluations on Sunday. Paws & Effect plans to conduct smaller, 2-hour badge workshops once or twice a month. All dogs are welcome at all meetings, whether they have earned their Dog Scout badge or not. The first workshop will be Fri., June 19 at 7 p.m. Participants will work toward their Manners badges. A Facebook page for the Dog Scouts organization is here. 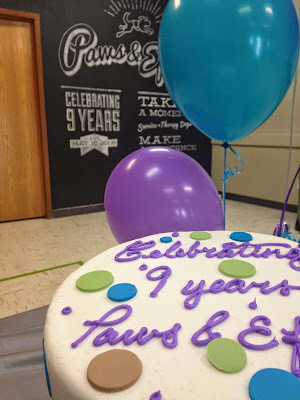 We Celebrate 9 Years by Opening Our New Storefront! 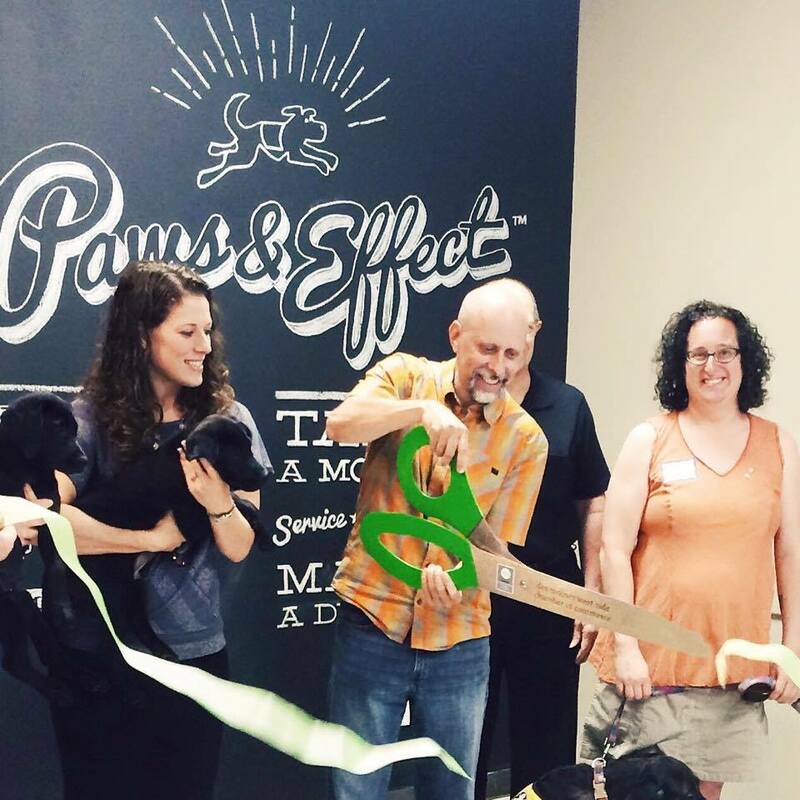 Simultaneously celebrating its ninth year of training service, therapy, and other animals, Paws & Effect has officially opened the doors of its new storefront facility in the Beaverdale neighborhood of Des Moines, Iowa! The address of our 1,500-square-foot space is 2629 Beaver Ave.—just a few doors down from landmark independent bookseller, Beaverdale Books! "As we gallop toward our 10th anniversary next year, establishing our own training and meet-up space was the next natural milestone for our organization," says Nicole Shumate, executive director for Paws & Effect. "We're building and sustaining our communities—puppy-raisers, dog trainers, Pet Partners, Dog Scouts, military veterans, allies and others—people and animals working together, for our mutual good." The new space features an office, training space, a community blackboard wall, and a reading room and lending library for both pets and handlers! Training class schedules and other events are now available! Sign up here! 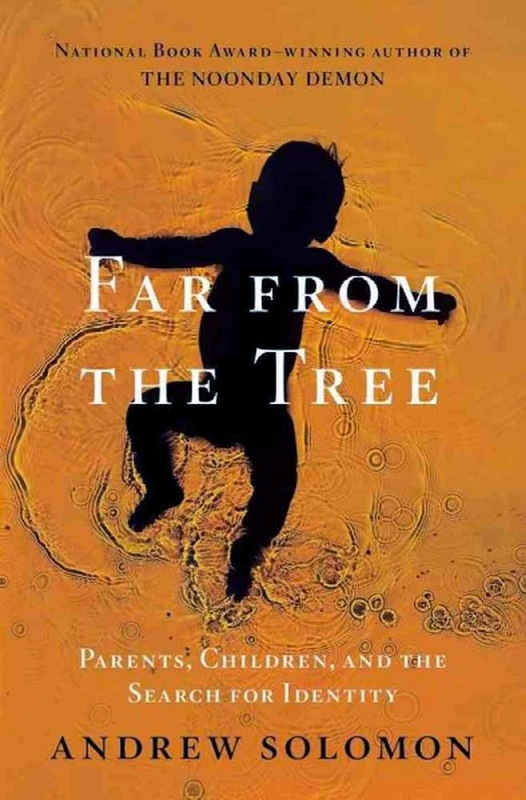 The next Paws & Effect Book Club selection for 2015 is "Far From the Tree: Parents, Children and the Search for Identity" by Andrew Solomon. The discussion will take place 6:30 to 8 p.m., Thurs., June 25, 2105 at the Grand View University main campus library, Des Moines, Iowa. "Far From the Tree is one of the most compassionate books I have ever read that treads in the deep, deep water of human differences," says Paws & Effect Executive Director Nicole Shumate. "This book attempts and succeeds in bringing in a unique point of view about differences; front and foremost it includes those family members and friends who love that person who is different." "Paws & Effect works with people every day whose lives may be very different from our own," Shumate continues. "This book both honors and celebrates differences, quickly doing away with stigma and prejudice, often finding perspectives that allow the rest of us to embrace the very things that we deemed difficult to begin with." The 976-page (including 200 pages of notes) book is also available available on Kindle or unabridged audiobook formats. Paws & Effect is excited to offer pet dog classes! We've brought together an experienced staff and some new-to-Des Moines opportunities. With a commitment to positive and clicker training, community members can now benefit from the same techniques as our service dogs and Pet Partner therapy teams. Paws & Effect is excited to introduce Ashley Anderson and Haylee Bergeland, who will be joining Heddie Leger, Nicole Shumate and Eric Shumate. This well-rounded team brings various backgrounds and experiences, creating a fun dynamic. Ashley is our lead service dog trainer, the first Iowa Karen Pryor Academy graduate with her certification as a training professional (KPA-CPT). Years of showing her own dogs in rally, obedience and agility gives Ashley an understanding of what is expected in the show ring, offset by her practical experiences raising and training service dogs (give Ashley a big congratulations on her recent accomplishment of raising the first ever clicker trained guide dog for Guide Dogs for the Blind)! Haylee joins Paws & Effect with experience training shelter and rescue dogs. She has worked as a training coordinator and behavior specialist for a large sized shelter, overseeing the development of dogs after they were adopted. Haylee has an Associate Degree in Animal Science with an emphasis in animal behavior and husbandry. Heddie comes to Paws & Effect with a Certification for Pet Dog Trainers-Knowledge Assessed (CPDT-KA). With years of experience as a dog trainer for Missouri's Puppies For Parole, Heddie combines her vast Pet Partner and Dog Scout knowledge as an instructor and evaluator for both organizations. Nicole brings more than a decade of experience as a Pet Partner evaluator and instructor, with a never-ending enthusiasm. Originally (and still wholeheartedly!) a Denver Pet Partner, she has a keen eye for making the most of what our dogs bring to our lives. Eric is also a Pet Partner evaluator and instructor, bringing his perspective to Paws & Effect after serving for many years on the National Pet Partner Committee. Classes will run over six weeks at a cost of $100, meeting once each week for an hour with a limit of six students. Discounts are extended to veterans, military members, Pet Partners and Paws & Effect service dog recipients. Check out our training page for information and to register for all of our classes by clicking here! We're looking forward to meeting you (and your dog) soon!